Feedback is an essential part of software user interface design. It’s especially true when designing applications for current mobile devices. Tapping a touch screen is less precise than clicking with a mouse. Touch screens also lack the tactile and auditory feedback of a physical key or button. Slow, unreliable cellular data access adds to the confusion. A user might wonder: Is the app broken or do I have a poor connection? Was my tap registered or did my fingers miss that tiny button? Making sure users get clear feedback in response to their actions and to changes in state or conditions is key to a great software experience. 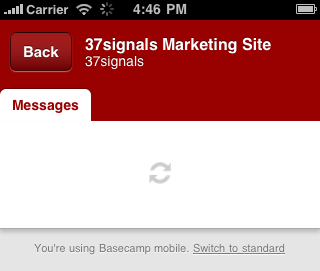 Basecamp Mobile is loading assets the first time you run it or when the local cache is empty. The large animation is the only element on the screen making it the focus. The lack of any other UI elements makes it clear that the only option here is to wait. Because people see this before they see the app, it’s even more important that we let them know what is happening. If this initial load is taking too long we let the user know. After a short wait, the app reassures people that it’s still working. If the screen still doesn’t load after a few more seconds the app offers some other options: Refresh the browser and try again or try the standard version. The latter option is useful for users who may be attempting to load the mobile optimized version on an unsupported device and need the option to switch back to the normal version. In the next state, the app has loaded and the UI is now available, the app is only loading content now. The user can always cancel the action and go back to the previous screen. You’ll see this the first time you load a screen that you haven’t loaded before like a newly posted message. The icon actually duplicates the functionality of the browser’s own loading spinner (visible in the top toolbar in the screenshot above) but we felt like people were likely to ignore or completely miss it. The approach brings the loading indicator a little closer to the action without making it more intrusive. We took a similar approach with the To-do Lists screen. For each list we wanted to show the first few items on it. This makes it clear these are to-do lists and helps people identify the one they need. The previews load after the page is available because the content is helpful but not essential. A very subtle effect doesn’t distract but makes it clear something is happening. A series of spinners would have overwhelmed this screen, but the subtle gradient shine moving over the word “loading” informs without distracting. Presented like this it may appear that the app is just a series of waits, it’s not. Most of these indicators are actually on the screen for just seconds, but that is sufficient time to quiet a user’s doubts and ensure they know things are working. It feels great to click through the app and always feel like you know what’s happening, that things are working. We use prominence of these indicators to tell people how important it is that they wait. The amount of surrounding UI is a clue about what else they can do if they don’t want to. You certainly have to wait for the app, itself, to load. 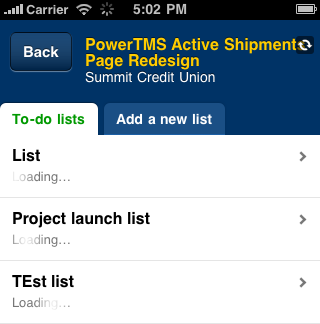 But you can pass right by a To-do list that’s fetching a preview of it’s items. Just the right UI feedback makes sure users know this without having to think about it. Jason Z. wrote this on Feb 14 2011 There are 22 comments. Great points. I think feedback is more important than ever with the explosion of mobile. One of my biggest complaints? Websites that don’t optimize their drop-down navigation for mobile devices. Because there is no such thing as a “hover” on a touchscreen, these extra links are totally inaccessible. Thanks in advance for useful tips. The ToDo list is useless if you have a long list. Takes ages to load, if you’re lucky that it didn’t freeze. I’m sorry it’s slow for you. We are working through some performance issues on accounts with lots of active projects and exceptionally long to-do lists. 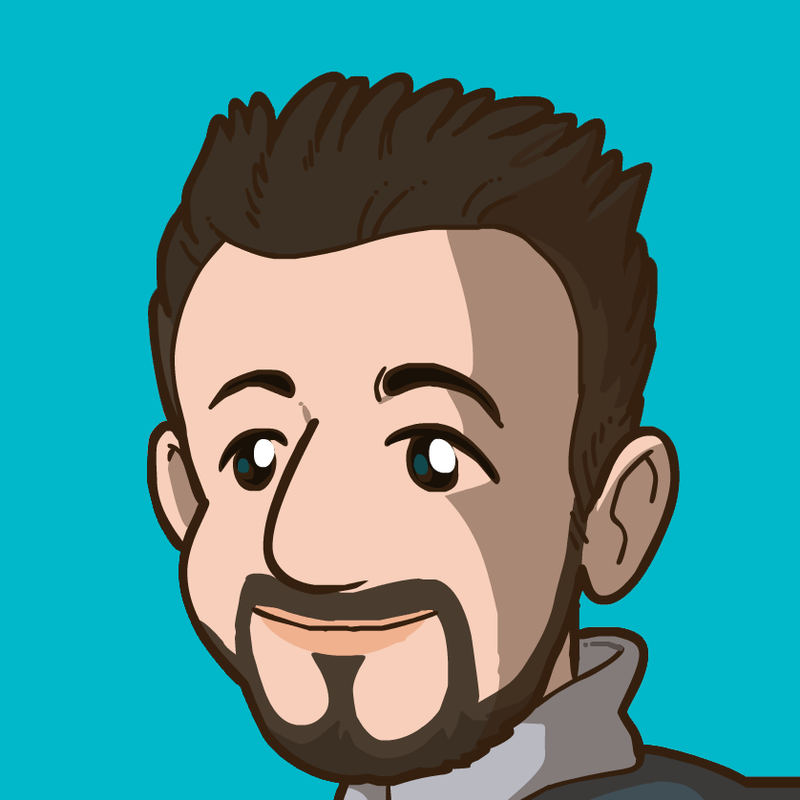 We’re hoping to push an update soon. Thanks for being patient. Amen – too often visual feedback is ignored, or tied to the event success. This is the kind of attention to detail that needs to be applied, yet so few do. Nice work. 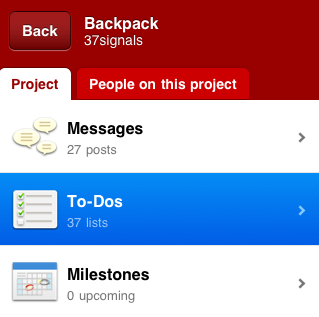 Just finished V1 of my first iPhone app. Wireframing (hat tip: Travis Isaacs and his Keynote wireframing kit) V2 now and feedback is at the forefront of design. That, and context (thanks Signals for Getting Real and Defensive Design). 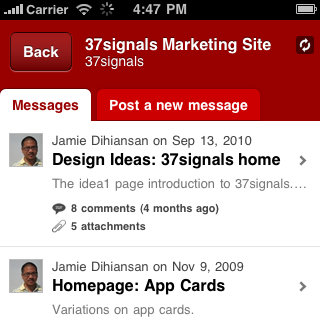 Moving on to mobile web app version and this sort of stuff is of paramount importance. JZ: how do you measure or decide when you’ve done enough optimisation and tweaking. Like, at some point any extra effort derives marginal utility and usefulness, keeping in mind the mobile network has latency. In Aust, I am on Telstra which is a premium 3G network (think 7Mbps in the back blocks of regional AU), so for me, Basecamp is fast. It’s actually slower in the city where network contention is higher. So, yep, how do you decide when enough is enough? These loading and wait screens often get overlooked, along with error messages, when working in development. It’s good to see you guys did real-world testing. I might suggest making the page loading icon (spinning arrows) more prominent. It’s easy to miss as it is. Are you using web sockets or polling for data transport? Thank you for posting this – It’s great to see such an often overlooked part of an app being focused on in such a positive way. @Tim – Support load is a good indicator. It gives us an idea of how many people are effected and how to prioritize them. I would be interested in how you approached the development of this project. It is a HTML5 app so you are using a lot of technologies you normally use. But the design is a complete change. Most of your existing apps the real work is done server-side (Rails encourages this) and client-side coding is mostly embellishments. This app flips that around. The server is a dumb data store and the real smarts are all client side. Did Rails support this type of development well or was that a battle? Does this run as a separate app (server-side) or do you have one app that is handling both desktop and mobile? So many other developers use the same stack and philosophy you do. It would be interesting to see how you approach the building of a mobile app. Let me know if you need more feedback! Thanks for the look. One question, when you get to level 3 of the initial screen (loading icon, message, and try again button). 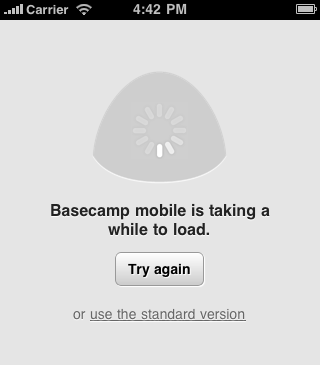 Should I assume that Basecamp is still trying to load? The throbber is still rolling so I’m assuming yes, but wasn’t 100% sure. Just checking that if I didn’t do anything (go to standard version or click the try again button) the page would continue to try and load? 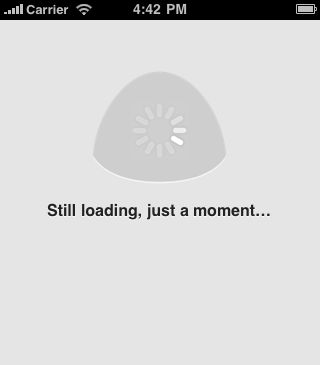 @Guy – yes, it continues to load. The feedback is just to let you know what is going on and what other options you have. JZ: The ‘Try Again’ still confused me a little, leading me to believe that it has failed, even though the text says otherwise. Thinking of these small details – some of which the average user might not even see – is what separates a “good enough” user experience from a thoughtful, elegant solution. It’s not enough to just create something that’s superficially user friendly; as ux designers we’re challenges to come up with an experience that degrades elegantly too. Very nice work. I’ve been using this for a few days and it’s been responsive while giving a lot of nice visual feedback. It’s not working on Windows Phone 7. Was the OS overlooked for any reason?